Is this the co-opting of “local” or just a really broad interpretation? My recent encounter in Oklahoma City with this “locally grown” jar of roasted bell peppers from Napa Valley caused me to revisit this fantastic article from last May, which explores the angles and issues with the “local” label. Mezzetta, Frito Lay, and others are making a case for “local” in relation to their processing plant and are clearly leaving the eater out of the equation. What merit does this have? Is this an improvement upon former business practices or is it merely a new marketing strategy for their status quo? When the labels we trust become diluted from government certification or opportunistic marketing gurus, they become, at best, nothing more than a game of semantics and at worst, completely meaningless. …the widening view of what it means to eat locally is similar to the changes the term organic went through as it grew from a countercultural ideal in the 1960s and 1970s to an industry with nearly $25 billion in sales last year. A related debate about how to define sustainable farming is now gathering force in government, agriculture and business. Here are some cool maps the NYT created using data from the 2007 Census of Agriculture. And here’s a map I made to show the distribution of Oklahoma Food Co-op producers. Related photos here. As a relatively petty aside, notice the color of the tomatoes. Nice essay on organic food. Clean food should not be a luxury item. An amazing 2002 article by Michael Pollan on industrial livestock: from artificial insemination to the shrink-wrapped steak. Extremely informative. I am sick of people using food to exacerbate perceived divisions. Just yesterday a state representative invoked “arugula” to conjure feelings of “us” and “them.” How is it that a salad green has come to represent elites, or in this case ignorant, elitist city-folk? Remember Obama’s so-called “arugula moment” in mid-2007? Ridiculous. It grows in the wild and is easy to cultivate, for goodness sake! What’s the big deal? It’s been hijacked as a political tool (remember “freedom fries”?). Could it be that Californians have actually gotten more informed about food and agriculture and that’s why they voted for Proposition 2? What do you think? 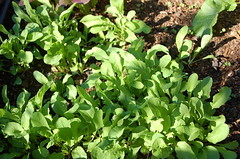 “Whether you call it roquette (French), arugula (Italian), or rocket (English), it’s a salad green with a spicy tang somewhere between that of cress and horseradish. If you want to try it, you’ll have to grow your own. The Census of Agriculture is conducted every five years by the USDA. Numbers were released yesterday. Some especially exciting data is that of direct farm sales (which includes farmers’ markets and roadside stands). In the U.S., the value of direct farm sales between 2002 and 2007 increased 30% (adjusted for inflation; at current dollars it’s 49%). In Oklahoma—and god I hope I calculated this correctly—between 2002 and 2007 the value of direct farm sales increased 167% (adjusted for inflation; at current dollars it’s 208%)! And for the 3,194 farms that have direct sales, the average amount earned from the sales was $3,611. While certainly not the bread and butter, it was a 61% increase from 2002 (adjusted for inflation; 85% at current dollars). Something is a rumblin’, I can feel it. Do you know where your food comes from? I wonder, when Oklahoma Food Co-op producers fill out these forms, do they include co-op sales as “direct farm sales”? 799 farms harvest 7,306 acres of produce for fresh market. 63 farms harvest 10,707 acres of produce for processing. Did you know we have 3 farms growing 15 acres of kiwi fruit here in Oklahoma? We have 518 farms with 1–9 milk cows. We have 6 farms that have 1,000 or more milk cows. We have 2,338 farms with 1–24 pigs or hogs. We have 41 farms that have 5,000 or more pigs or hogs. 114 farms sold 130,380,629 meat chickens in 2007. Female principal farm operators increased 24% between 2002–2007. The average age of the principal operator is 57.6. We have 35,087,269 acres in agricultural production. Here’s a readable synthesis of the U.S. numbers. And more about agriculture in Oklahoma here and here.